ALLEGRA BOVERMAN/Staff photo. Gloucester Daily Times. Gloucester: During a daylong visit to East Gloucester Elementary school by Gloucester High School Honors Physics and Physics of Robotics classes students on Friday. 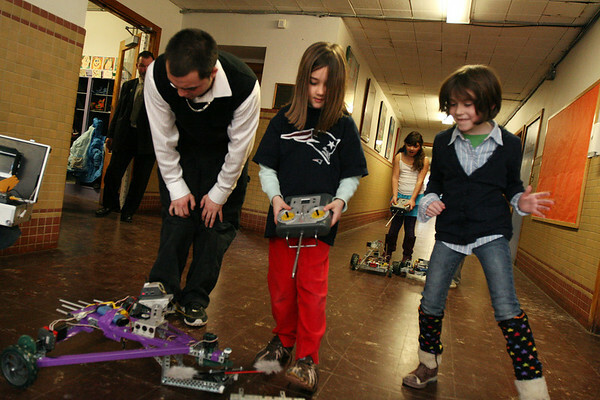 From left: GHS senior David Smith works with second graders Annie Kate Convey, center, and Lily Muniz, to operate his triangular robot he built with classmate Sean Dunne (not shown). The robot has a helicopter blade on the front and a video camera on top, and was built with creativity and innovative design in mind. In the background is second grader Lidia Quintanilha, operating a robot.